The newest members of the Alpha Omega Alpha medical honor society were inducted at a ceremony on March 18. 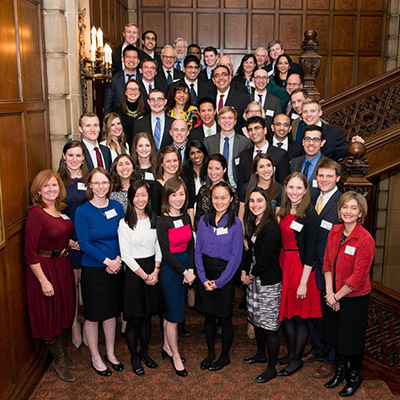 Holly Humphrey, MD, dean for medical education at the University of Chicago Pritzker School of Medicine, gave the keynote address before the Alpha Omega Alpha (AOA) medical honor society induction ceremony on March 18. AOA acknowledges scholarly achievement and qualities such as leadership, professionalism and community service. Inductees included medical students, residents, fellows, faculty members and alumni. Dr. Humphrey’s presentation focused on the role of medical education in controlling health care costs and on Choosing Wisely, a campaign to help physicians and patients engage in conversations about the overuse of tests and procedures and ways medical students and residents are addressing these issues. “We have an obligation to teach future physicians about managing health care costs in a very complex environment, and one of the reasons I have devoted my entire career to medical education is that very often it’s the students and residents who do come up with the best ideas,” Dr. Humphrey said. Following the lecture, guests attended the induction ceremony, where John Flaherty, MD, councilor of the AOA Illinois Gamma Chapter and professor in Medicine-Infectious Diseases, congratulated inductees and welcomed family and faculty members. John Thomas Jr., PhD, senior associate dean for Medical Education and Sandra Sanguino, ’93 MD, associate dean for Student Programs and Career Development welcomed the 30 new medical student members into the society. “All of my classmates worked hard through medical school and it’s a huge honor to be inducted into AOA,” said Kristen Unti, a fourth-year medical student. 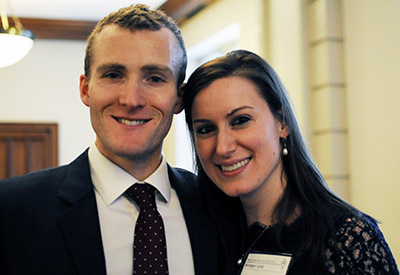 Unti met her fiancée and fellow inductee Benjamin Kester during medical school orientation. (Left to Right) Fourth-year medical students Benjamin Kester and Kristen Unti, were inducted into the Alpha Omega Alpha medical honor society at a ceremony on March 18. Other medical students inducted included Bayard Carlson, Liza Michelle Cohen, Paul Joseph Devlin, Amanda Blanche Fuchs, Adina Goldberger, Brian Soonghyun Han, Philip Hanwright, Annsa Huang, Aditya Kanesa-thasan, Andrew Hoover Karaba, Sara Marie Karaba, Andrew Steven Kern, Betty Kong, Christopher Kovach, Joshua Lee, Timothy Maher, Mark Maroongroge, Christian Mewaldt, Shobhit Minhas, Hannan Asim Qureshi, Hannah Stephanie Recht, Anne Reihman, Laura Sena, Robin Skory, Katherine Anne Teter, Christina Thomas, Mahesh Krishna Vidula and Joshua Waitzman. New housestaff members were announced by Marianne Green, MD, associate dean for Medical Education and Competency Achievement. They were honored for ongoing leadership in their field, active participation in teaching and community service. Residents and fellow inductees included Amy Archer, MD, PhD, fellow in Rheumatology, Amy Elizabeth Armstrong, MD, resident in Pediatrics, Jill M. Huded, MD, fellow in Internal Medicine and Geriatrics, Peter “Rocky” Samuel, MD, MBA, resident in Emergency Medicine, and Jeremiah Wasserlauf, MD, chief medical resident in Medicine. Faculty members welcomed into the society by Diane Wayne, ’91 MD, vice dean for Education included Michael Abecassis, MD, MBA, chief of Organ Transplantation and founding director of the Comprehensive Transplant Center, Frank Miller, ’88 MD, professor in Radiology, Rukhsana Mirza, MD, MS, assistant professor in Ophthalmology, and John Varga, MD, John and Nancy Hughes Distinguished Professor of Rheumatology and director of the Northwestern Scleroderma Program. “I am honored to be selected as a member of AOA with such a talented group of people and am thankful for those that have nominated me to the society,” Dr. Miller said. Andrew Bunta, ’67 MD, past president of the Medical Alumni Association, announced alumni inductees Alicia Armstrong, ’81 MD, professor of Obstetrics and Gynecology, Uniformed Services University of the Health Sciences and Howard University and medical officer at the Contraception Discovery and Development Branch, National Institutes of Health; and Dmitry Pyatetsky, ’01 MD, assistant professor in Ophthalmology.